With the next key joint Villa Charities and Toronto Catholic District School Board (TCDSB) project milestone in site, the time is right for us to pause and consider where we are now and the road that lies ahead. It’s a good time for celebration for our friends at the UJA Federation of Greater Toronto. Eight years after the Bathurst Community Centre in Toronto was torn down, construction of a new building was launched on October 15, 2017, with construction to be completed by 2019. Many of you may recall that the ranks of the Columbus Centre grew dramatically (in the thousands) when the Jewish community lost their facility. With no other local options available, the Columbus Centre benefited in many ways from their decision to relocate temporarily to our facility. This new facility will dramatically change the competitive community landscape and services available to everyone. Congratulations on realizing your vision! The City of Toronto, the Toronto District School Board (TDSB) and the Toronto Catholic District School Board (TCDSB) are collaborating to build a multi-use community facility next to Canoe Landing Park. Construction began in 2017, with the completion of the schools scheduled for the fall of 2019. This integrated multi-use facility provides shared services that make a thriving neighbourhood. It’s unfortunate that in recent times our community, which has so much to be proud of and so much to offer, has participated in a way that has alienated many of us. While others have moved forward to realize their dreams or have embarked on new creative solutions to dealing with the needs of their communities, we have engaged in ways that do little to enrich our culture or demonstrate progress. The elimination of corporate office space, which prevents us from developing a centralized home for different Italian cultural organizations and businesses. Have we learned nothing from the past 12 months? Once a leader and a respected institution that embraced and added value to the entire community, today the Columbus Centre struggles to remain relevant. While others are quickly moving to add new and expanded services, we are determined to hold on to the past. While others embrace new partnership models to better serve their communities, we “fear” the unknown and prefer to isolate ourselves in the face of a changing community. Rather than working together, we are intent on working against each other. Over the past 12 months, the Italian community has demonstrated the “worst” elements of our culture. People have been lied to, bullied, intimidated and discriminated against by age, gender and religion. The elderly, who Villa Charities was created to support and nourish, are being manipulated like pawns by those who “pretend” that their objective is to protect the history and culture of this organization. In truth, those that seek to manipulate the process are more interested in preserving their “daily routines”, selling newspapers as they “journal lies” or line up votes for the next election. We have driven many of our past supporters to the sidelines and new ones are reluctant to get involved. Our ancestors had the courage to explore new worlds, our parents and grandparents left their homeland and families in search of a better quality of life not just for them but for their families, children and grandchildren. The world we live in today is very different than it was for our parents and their parents before them. Barriers to travel, communication and access to information, for the most part, don’t exist anymore. Cultures are not being shaped by our immediate families, communities or local towns, they are being influenced by factors around the world. Italians and Italian culture have contributed and shared in many wonderful ways to society and humanity throughout the ages. As Italians and Italian-Canadians we have a responsibility to preserve and carry on that tradition, to respect each other and to teach our children this important lesson. There is too much at risk if we fail to recognize our role in this changing society. It’s time we come together! Thank you to everyone who participated in the community consultation project for the Columbus Centre/Villa Charities & Dante Alighieri Catholic Academy Intergenerational Community Hub. The final report is now available to review and download from the Maximum City and Dillon Consulting website. Click here to read the final report. Reduced levels of loneliness, isolation, boredom, depression, anxiety and agitation. A heightened sense of purpose and meaning. Development of strong, meaningful relationships with youth. Elevated mood, gaining new knowledge and skills, increased self-esteem, and positive mental and physical health outcomes. This issue of the Columbus Centre/Villa Charities & Dante Alighieri Academy Redevelopment newsletter explores the concept of mixing generations of young and old people together. Numerous studies and practical examples demonstrate that placing people of different ages together delivers valuable benefits to both seniors and younger people alike. Throughout the Villa Charities campus, young and old have always existed side by side in a variety of programs and activities. At its outset, Villa Colombo, Villa Charities’ first long-term care facility, housed a daycare centre. Children and seniors co-existed and participated in numerous activities on a daily basis, to the enjoyment of all involved. Just this past December, at the Casa Del Zotto seniors’ apartments, children from the Columbus Centre child care centre sang Christmas carols to residents, with assistance from Dante Alighieri Academy students. Today at the Columbus Centre, large numbers of children participate in athletic, aquatic, dance, music and language programs, attend camps and art shows, and join in with their families in many other ways – all in the presence of seniors and other adults. The Columbus Centre is used regularly by Dante Alighieri students for co-op education and physical education programs. They utilize the library, meeting rooms and numerous other amenities throughout the facility. Student leaders help seniors at Villa Colombo during week-long annual fire drills. Others regularly complete community service hours in the Columbus Centre and at the various on-campus seniors’ residences, or are placed as co-op students in the Columbus Centre daycare, Villa Colombo day programs for seniors and the long-term care facility itself. The school also uses the Sala Caboto ballroom and courtyard space for graduation events. In turn, Dante Alighieri Academy facilities are used regularly by on-campus seniors for movie nights, bingo and cards, and for meetings and classes run by Centro Scuola. The school often shares its playing field with Villa Charities and hosts special guests of Villa Charities and the Columbus Centre on request. In short, a great deal of intergenerational mixing and sharing of facilities already happens in and around the Columbus Centre. The new Columbus Centre will be an enhanced intergenerational hub with expanded features, programs and services for all. There is abundant empirical evidence that seniors benefit from improved self-esteem, a feeling of usefulness in their community and from increased mental and physical activity. According to an article published by St. Elizabeth Health Care, “For seniors participating in intergenerational day care programs, the opportunity to spend time with children and the joy they bring is often the highlight of the day.” Children gain as well, from the reinforcement of manners, patience, tolerance and empathy along with the development of social skills. A comprehensive scan of the academic literature on intergenerational programming, prepared by the Schlegel-University of Waterloo Research Institute for Aging, identified numerous benefits for young and old alike. For older adults, participants in intergenerational programming “tend to experience an increase in their quality of life and overall well-being,” the August 2017 review found. Children and youth develop positive attitudes towards aging and older adults, gain social skills such as learning how to cooperate with others, and become more self-confident. News outlets have also turned their attention to the positive results of intergenerational programming, including the Toronto Star in a Feb. 9, 2016 article and an Aug. 17, 2017 article*. The benefits of intergenerational mixing have become so well recognized that a US-based organization, Generations United, was created over 30 years ago to advance the cause. Generations United has published a fact sheet, backed by numerous academic studies, summarizing the benefits. The Columbus Centre and Villa Charities have a long and positive history of mixing young and old within our facilities and through intergenerational programming. We can all be confident that the redevelopment of the Columbus Centre as a shared-use, intergenerational hub will benefit all members of our community, as demonstrated by extensive research. It’s clearly time for those who fear it, to embrace it and enjoy all it has to offer. A shared commitment to sustaining and promoting the Italian language and culture is the cornerstone of Villa Charities’ more than three decade-long affiliation with Centro Scuola e Cultura Italiana. Centro Scuola, which offers Italian language learning and cultural exchange opportunities for students of all ages, has been an integral part of the Columbus Centre since 1984. Centro Scuola organizes Saturday morning Italian classes for children, where students are engaged through sport and cultural activities such as cooking, hands-on summer school credit courses in Italy in partnership with the Toronto Catholic District School Board (TCDSB) and York Catholic District School Board (YCDSB), and adult classes. Beyond its core Italian language programs, Centro Scuola organizes many events that bring numerous students and parents to the Columbus Centre. These include the annual Nativity Scene exhibit at the Centre’s Joseph D. Carrier Art Gallery, viewed by approximately 2,500 students each December, and the Festival of the Italian Language on the Columbus Centre grounds each June, where more than 2,000 TCDSB and YCDSB students celebrate the winners of an Italian-language essay contest, and perform songs and dances. The Festival is a key part of the annual Italian Heritage Month celebrations at the Columbus Centre. In addition, Centro Scuola, in collaboration with the Columbus Centre, organizes movie nights, book presentations, concerts and conferences throughout the year. Villa Charities was also a proud sponsor of the Centro Scuola Christmas Concert at St. Charles Borromeo Church in December. The school’s focus on Italian language and culture make it a natural fit with the Columbus Centre and the various athletic and cultural programs and events offered by the centre itself. Villa Charities is proud of our long-standing relationship with Centro Scuola, which plays an important role in supporting our mission “to celebrate and promote the Italian Heritage, Culture, Language, Arts, Food, and Family Values”. Both organizations have committed to continuing the relationship within the proposed redeveloped Columbus Centre. The redevelopment project, in partnership with the Toronto Catholic District School Board (TCDSB), provides Villa Charities with a unique opportunity to create a new and better Columbus Centre, as a premier cultural and learning destination. The new intergenerational hub will continue to honour, preserve and share Italian heritage, language and culture. This will be supported by improved resources for valued community partners like Centro Scuola, as well as enhanced cultural programming, art and museum heritage displays, and state-of-the-art classrooms and studios for programs in art, music, dance and culinary arts. Villa Charities is unwavering in our determination to ensure the Columbus Centre plays a critical and valuable role in Italian culture and our local community. An important part of this commitment is a continued association with Centro Scuola in a new, intergenerational centre that continues our long tradition of offering programs that bring together youth and seniors. As we approach the next milestone in the evolution of the Columbus Centre and come together to share the results of the public consultation process, it’s important that we take a moment to reflect on the journey to date and the road that lies ahead. We would like to express our sincere appreciation to all of you who have participated in the consultation process, whether via the community workshops, stakeholder focus groups, telephone and online surveys, or site visits. We are grateful for your time, your ideas and your passion. Regardless of your point of view, one thing we can all agree on is that the Columbus Centre is an important part of our history and future, when it comes to sharing our culture. As many of you know, the Villa Charities campus, including Villa Colombo Toronto, the Columbus Centre, Caboto Terrace and Casa Del Zotto, was created through the vision and determination of those who preceded us. Each of these projects had their share of supporters and opponents and today, unquestionably, we are all better for the perseverance of those whose ultimate objective was to create a legacy for generations of Italians and our local community to enjoy. Fast forward to 2018 and the vision and goal of Villa Charities has not changed. In the last decade, the leadership of Villa Charities has been actively working to enhance our mission “to celebrate and promote the Italian Heritage, Culture, Language, Arts, Food, and Family Values” by reimagining how to make the Columbus Centre better. Never in the history of our civilization have we experienced change like we do today. We can debate whether change has been good or bad, but we can’t dispute that it will continue and will impact all of us. Society, organizations and individuals are constantly changing. It’s a natural part of our evolution and the Villa Charities we know today is a testament to that reality. Nothing survives without responding to change. As such, the leadership of Villa Charities has been actively exploring options in response to the changing circumstances impacting the Columbus Centre. An aging facility, the inability to attract 2nd and 3rd generation Italian-Canadians, the changing fabric of our local community, increased competition, financial constraints, services gaps, an Italian community that now is dispersed throughout the Greater Toronto Area…the list of change factors is a long one. As Villa Charities explored and evaluated a wide variety of options we had one goal in mind above all: “Our heritage, our culture and our community deserve the absolute best centre for Italian culture.” Ultimately, a partnership with the Toronto Catholic District School Board (TCDSB) was determined to be the best option available. In one word: synergy. It quickly became clear that by working together, both organizations could accomplish more than by working individually. We share a common vision and values, and have a long history of successful joint working relationships. As partners, both organizations provide resources and expertise, which will enhance the experience for everyone. Each organization respects the importance of culture, education and intergenerational family values. By collaborating to create a shared-use facility, the public will have access to better-quality facilities and an expanded variety of programs and services. Finally, both organizations clearly recognize the importance of investing in the long-term success of those they serve. Not capitalizing on this unique relationship and opportunity not only does a disservice to current users, but to future generations. A group of opponents to this project believes that by derailing the partnership with the TCDSB, they can ensure that the Columbus Centre will continue as it exists today. This view ignores the reality of change all around us. Regardless of who you are and what your agenda may be, and whatever the findings of the preliminary public consultation report to be presented Monday, change is a certainty for the Columbus Centre. The status quo is not an option. We began this journey with a clear objective: “How do we reimagine the Columbus Centre to ensure it is vibrant, inclusive and relevant”? When organizations who provide services or products fail to respond to a changing environment, they soon find themselves “out of business”. A failure on our part to embrace change and respond accordingly would ultimately have negative consequences for all parties. We can’t and we won’t let that happen! The Columbus Centre, what it represents and what it was created to accomplish, needs to change in order to survive. The people we serve deserve and should expect nothing less. The services offered and the communities that embraced the Columbus Centre when it opened its doors in 1980 have continuously and dramatically changed in the last four decades, and it would be naïve to believe that will not continue. All of us involved have no option but to move forward. This project is not just for “us”; it is for our children and grandchildren. We have a collective responsibility to understand the issues and participate in a respectful and collaborative manner. Just as each of you want the best for your families and children, Villa Charities wants the best for the people and communities we serve. However, individually or collectively as a family, those options that are available to us and how we utilize our resources are constrained by how much we have and what priorities need to be addressed. Villa Charities is no different. All of us are determined to ensure the Columbus Centre plays a critical and valuable role in Italian culture and our local community. For those of us who bear the responsibility and privilege of fulfilling this role, our commitment and dedication has never wavered and never will. I want to take a moment to share a vision for the redevelopment of the Columbus Centre in partnership with Dante Alighieri Academy, to create an Italian-Canadian intergenerational community hub. For almost 40 years, the Columbus Centre has served as an important resource for Toronto’s Italian-Canadian community and its local community. Many people have been asking, why rebuild the Columbus Centre at all? Here I hope to answer those questions. Why Rebuild the Columbus Centre? Much of the original building housing the Columbus Centre was originally built 70 years ago as a correctional institute for girls. Ongoing repairs to maintain the building are expensive and lead to frequent service downtime. In conjunction with the Toronto Catholic District School Board (TCDSB), Villa Charities has a unique opportunity to create a new and better Columbus Centre. The proposed intergenerational community hub will be a premier cultural and learning destination for Italian-Canadians in the GTA and others wishing to explore Italian culture, as well as a 21st century educational environment for students.The redeveloped Centre will continue to celebrate, honour and promote Italian heritage, culture, language, arts, food and family values while providing greater access to services and much improved facilities to the communities we both serve. Why Partner with the TCDSB? Villa Charities and the TCDSB have a long-standing working relationship. By partnering in a joint facility, each organization can offer their stakeholders a greater variety of services, invest savings from lower operating costs in programming and facilities and encourage intergenerational learning. The top five mother-tongue languages in the Eglinton-Lawrence area today are Pilipino, Italian, Spanish, Chinese and Portuguese. We are reimagining a Columbus Centre for everyone. And while Columbus Centre patrons represent all age groups, the under-40 cohort is the largest group. We want to recognize and respond to a diverse and changing set of community needs, while still preserving, enhancing and sharing Italian culture with that wider audience. Villa Charities is not redeveloping the Columbus Centre to build condominiums. In fact, there are no plans whatsoever for a condominium development. And in terms of history and heritage, the new building will house an art gallery and museum to provide symbols of Italian culture in our community. Key features and benefits of the joint facility will also include a 435-seat performing arts theatre, advanced fitness facilities with a swimming pool, world-class dance and music studios and an international culinary kitchen. St. Charles Borromeo Church is not moving or being demolished. Any decision about the future of the Church is a matter for the Roman Catholic Archdiocese of Toronto. 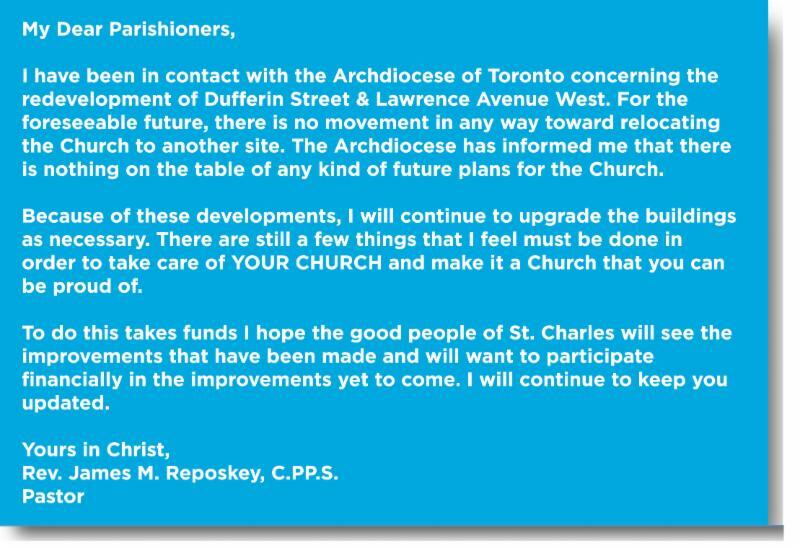 Reverend James M. Reposkey, the Pastor of St. Charles Borromeo Church, told his parishioners that the Archdiocese of Toronto has no plans to demolish or relocate the church. The Columbus Centre is not ‘evicting’ its customers. The Centre will remain open and operational until summer/fall 2018. We will ensure service continuity through interim sites until the new facility opens in fall 2020. One concern of some people in the community is that the dynamic would change if the high school is connected to the Columbus Centre. However, young and old have always existed side by side here. For example, the Centre is used by Dante Alighieri students who help seniors at Villa Colombo during week-long fire drills. Students complete their community service in the Centre and at our seniors’ residences. In turn, Dante Alighieri Academy is used by seniors for movie nights, bingo and cards. In short, a great deal of intergenerational mixing and sharing of facilities already happens. As the Star’s social justice reporter Laurie Monsebraaten identified in her 2016 piece, Magic abounds when seniors share space with youth and children. The Research Institute for Aging also identified numerous benefits for combining young and old in its August 2017 report. Older adults experience increased quality of life, while children and youth develop positive attitudes towards aging and gain social skills. We greatly value the input of our customers, and encourage feedback to develop a plan that best meets the needs of Italian-Canadians and an increasingly diverse community. To that end, we have engaged independent consultants to lead a community-wide consultation process, now underway. Through the Columbus Centre redevelopment, Villa Charities is determined to improve the quality of life for our community, now and in the future. Villa Charities has provided numerous opportunities for community input and dialogue on the Columbus Centre/Villa Charities & Dante Alighieri Academy Redevelopment over the past several months, leading up to the formal, third party-managed consultation now underway. It makes no sense, therefore, that the loudest critics – those who even now argue that community input has been shut out – refuse to participate in the consultations they demanded. Those critics, who represent a minority perspective of the Columbus Centre community, continue to choose confrontation over consultation. It has become clear that they oppose all changes to the Columbus Centre and are also opposed to any consultation process that even contemplates change. The unfortunate reality is that the behaviour of some of these critics has been downright abusive and disturbing, including making threats to staff and racial slurs. They are for the most part completely close-minded on discussing options and would prefer to spread lies and deception for a vulnerable population. When these critics argue that we must ‘honour the Founders’ of the Columbus Centre, we marvel at the irony of how their appalling behaviour would be viewed by our Founders. The Founders who had the courage and perseverance, acquired essentially a vacant property, and developed it to realize their vision and dreams, despite those who opposed them. Somehow, contrary to all evidence, the harshest critics think the Columbus Centre can just remain as is, unchanged. It can’t. Look around the neighbourhood, the country, the world and change is everywhere. Organizations in both the public and private sector are faced with very real need to “reimagine” how they can best serve those who utilize their services or buy their products. If the redevelopment does not proceed, the future of the Columbus Centre, and the valued services it provides to the community, will not escape change. Despite their intransigence, lies and unacceptable behaviour that we have been forced to endure, we will continue with our professionally run consultation process so that we can ensure the new facility responds as much as possible to the needs and wishes of the majority. A “survey” is currently being circulated by CASA, a “self-proclaimed group” misrepresenting the project to create fear and distract people from having a productive dialogue. Though the questionnaire states that CASA seeks to “ensure the integrity of the data we collect,” the questions are sprinkled with misinformation to produce misleading results. No matter what reassuring words CASA uses to dress up its so-called survey, it does not allow for the sharing of objective, fair and balanced opinions. Question 1: What is your connection to the Columbus Centre? The choices offered focus primarily on those who use the Athletic Centre. For the most part the cultural programs and other services we provide are not identified. Programs such as dance, music and art classes, March Break and Summer camps, child care, special events and other activities are ignored. Question 3: Do you pay a monthly/annual membership fee to the Columbus Centre? Everyone who uses the Columbus Centre and the services pays a fee. Whether that fee is monthly, annually, attached to a specific event, a class, or a meal, everyone is treated equally. Those who pay a fee to use our Athletic facilities are no better or worse than any student who registers for a class, a patron who displays their art in our gallery or an individual who eats in our restaurants. We value all their ongoing support and input. We don’t discriminate by the value of their contributions or the length of time they have used our facilities. Question 4: In order of importance (1, 2, 3, …), what most concerns you about the VCI/TCDSB plan for the Columbus Centre? Access to the Athletic facility and classes will not be “reduced;” in fact, our core facilities will be greatly enhanced and many existing programs will continue to be provided, as we have stated clearly all along. In some cases, where the utilization of our services and facilities have reached unsustainable low levels, changes are necessary. Loss of the rotunda/art gallery: There will be no “loss” of the rotunda/art gallery; rather, these facilities will be preserved, enhanced and elevated to new levels that will attract a wider audience. Sharing locker rooms with high school students: The sharing of services has not been finalized and is open for discussion. Both organizations are committed to respecting the needs of their individual users and offering them new opportunities currently unavailable. Question 6: Would you object to the development of new condos on part of the property … if that plan preserved your current use(s) of the Columbus Centre and its surrounding grounds? As stated many times previously, the joint venture with the TCDSB does not contemplate condos. The partnership provides Villa Charities with a much-needed source of revenues to ensure the vitality of the Columbus Centre for the next generation through better programming and facilities. Question 7: Currently, the Board of Directors of Villa Charities is an unelected body. Peoples’ names are put forward and a committee of the Board decides. In the future, would you prefer having all Board members elected to the Board by members and tenants of the Columbus Centre? As with other non-profit organizations and registered charities, our organization follows public best practices and standards for the process by which new Board members are proposed, reviewed and elected. The Villa Charities and Columbus Centre Boards include a diverse membership that reflects a cross-section of ages, demographics and gender. Contrary to CASA’s previous false assertions (outside the survey) that the Board is composed of predominantly real estate developers, our board members provide a wide and well-rounded range of expertise from a variety of industries including legal, finance, manufacturing, diversity studies, communications, engineering, food services, real estate and consulting/project management. We recently produced a 30-minute television special and supporting 2-minute segments about the new Columbus Centre/Villa Charities & Dante Alighieri Academy Intergenerational Community Hub. The show provides insights into the redevelopment project from Villa Charities’ CEO Anthony DiCaita, VCI Board Chair Aldo Cundari and Board Director Gina Valle, and highlights the key features and benefits of the proposed joint facility with the TCDSB. The special, titled “Columbus Centre: REIMAGINE 2020 / Il Futuro del Columbus Centre,” will be airing regularly on the TLN and Mediaset Italia channels now through Tuesday, January 2, 2018. We encourage you to watch this informative program, which can also be viewed by clicking here. The supporting 2-minute segments can be viewed here, here and here. A handful of the most vocal opponents of the Columbus Centre/Villa Charities & Dante Alighieri Academy Redevelopment have spread unfounded rumours and in some cases, outright lies, among Columbus Centre customers and our community. It’s time to set the record straight. So today, we will tackle the biggest myths head-on by responding to them with facts and the truth. 1. Is Villa Charities redeveloping the Columbus Centre to build condominiums? NO. This is nothing more than an unfounded lie. There are no plans for a condominium development. 2. Is Villa Charities tearing down Villa Colombo Toronto? NO. The next major project for Villa Charities is improving Villa Colombo Toronto in response to the Ministry of Health’s mandate to upgrade long-term care beds throughout Ontario. 3. Is Villa Charities tearing down Caboto Terrace and Casa Del Zotto? NO. Both buildings provide affordable housing to our community and are very important to our mission and how we will always support our community. 4. Will St. Charles Borromeo Church be moved or demolished? NO. Any decision about the future of the Church is a matter for the Roman Catholic Archdiocese of Toronto. 5. Is Villa Charities abandoning its seniors? NO. Serving seniors is the reason our organization was started, and it remains at the core of our existence today. Last year, Villa Charities, through our long-term care facilities Villa Colombo Toronto and Villa Colombo Vaughan, cared for 679 senior residents. Villa Charities also provides housing to over 700 independent seniors, many of which live in affordable rent-geared-to-income apartments. Our dedication to seniors remains as strong as ever. 6. Is the Columbus Centre ‘evicting’ its customers? NO. A group representing a small number of Columbus Centre customers has recently posted signs stating “4,000 Columbus Centre Members Being Evicted”. This is absolutely false. It amounts to nothing more than a groundless scare tactic designed to spread doubt and unrest in our community. Here is the truth: The Columbus Centre is being redeveloped to create state-of-the-art new facilities that will offer more cultural, athletic and other programs and services, with improved access for people of all ages. The Columbus Centre is projected to remain open and fully operational until at least June 30, 2018. Construction is expected to begin in summer 2018; work is underway now to locate interim sites in the local community for our existing programs, tenants and other services. The goal is to maintain service continuity for our customers right up to when the new facility is expected to open, in fall 2020. 7. Is the Joseph D. Carrier Art Gallery closing? NO. Art exhibits at the Joseph D. Carrier Art Gallery are booked through to at least June 30, 2018. The current proposed plans call for the new Centre to include an art gallery and Italian heritage museum. 8. Will the Italian Fallen Workers Memorial adjacent to Villa Colombo be moved or demolished? NO. Construction of the new Columbus Centre will not affect the Italian Fallen Workers Memorial. Between 150 to 200 opponents, as reported by the CBC, turned out last Wednesday night to protest the Columbus Centre/Villa Charities & Dante Alighieri Academy Redevelopment. Fortunately, they do not speak for the other 20,000 members of the Columbus Centre community. Our message to those who oppose the project is this: we will not allow less than 1% to sweep aside the other 99%. We are passionate, committed and determined to develop the best solution for 100% of our community. For many in the 1%, they are not interested in talking about a better facility, with more programs and services, of a new performing arts theatre, enhanced cultural options (culinary, education, language, music and the arts). Their mind is closed to opportunities to share and develop better relationships and experiences with different generations. What’s encouraging however, is that the vast majority of those who do use the facilities are thoughtful, open-minded individuals who recognize the need for change but at the same time are passionate about ensuring that a new facility retains the character, culture and heritage of the current building. The mission of Villa Charities is to ‘celebrate and promote the Italian Heritage, Culture, Language, Arts, Food, and Family Values.’ This is what we have done for almost 50 years, and what we will continue to do for the next 50 years. We provide a variety of programs and services for everyone in our community: from daycare services for children, to cultural and athletic programs for students, adults and families, to culturally sensitive long-term care and housing for independent seniors. We are determined to improve the quality of life for our community. We remain absolutely committed to this mission. The community we serve at the Columbus Centre has strong representation from all age groups. In fact, customers under 40 years old comprise the largest single segment of our patrons. As Census data from Stats Canada shows below (Eglinton – Lawrence area), we need to listen to and respond to all age groups in our community profile. Serving seniors is the reason our organization was started, and it remains at the core of our existence today. Last year, Villa Charities (Villa Colombo Toronto and Villa Colombo Vaughan) cared for 679 long-term care residents. Villa Charities also provides housing to over 700 independent seniors many of which live in affordable rent geared-to-income apartments. Our dedication to seniors remains as strong as ever. Villa Charities remains rooted in the Italian culture, heritage and language, but we also recognize that we serve an increasingly changing and diverse community. Approximately 80% of our customers live within a 5km radius of our site. As the data below indicates, our community has changed dramatically in the past 20 years alone. Although the number of Italians have dropped by almost 50%, Villa Charities is adamant to preserve our mission and find new ways to share it with our communities. Unfortunately, there are a select few among those who oppose the project who are using racial slurs and false accusations to undermine the project. They have intimidated young people in meetings, bullied their peers and recently resorted to vandalizing Columbus Centre property. Italians who immigrated to Canada decades ago, faced similar opposition, but were not deterred in their quest for a new and better life. They embraced change, dealt with adversity and worked harder to make a better life and home for their families. It’s time now for our community to embrace change once again. It’s also time to start a productive dialogue. We are determined to build a better Italian cultural centre, with our partner the Toronto Catholic District School Board, that meets the needs of our community and stays true to our mission. The upcoming community consultation process offers all of us a fresh start. It’s time we all REIMAGINE the Columbus Centre as a gathering place for all ages and ethnicities, and as a hub for Italian HERITAGE, CULTURE and COMMUNITY. Sustaining the mission of any organization is a challenge, particularly in times of rapid change. Faced with more options, competition, a changing community and different generational expectations, cultural organizations of any national origin are struggling to remain relevant to the people they serve and to the mission they strive to support. Villa Charities and the Columbus Centre are no different. Opinions may vary and passions run high, but you would be hard pressed to find anyone who doesn’t want to see this organization thrive on behalf of the current and future generations it serves. Standing still is not an option. Clinging to the past and isolating ourselves from younger generations and a changing community will ultimately and inevitably lead to the demise of the Columbus Centre, as it would for any organization. Those who fell in love with the Columbus Centre years ago and cherish it to this day must recognize that “to celebrate and promote the Italian Heritage, Culture, Language, Arts, Food, and Family Values” in today’s context, we need to think differently. No one wants to destroy the Columbus Centre. Those who claim that this is Villa Charities’ goal are making false and groundless claims. Those who use these tactics and yell the loudest are trying to create fear and bully the more vulnerable members of our community who can’t access or choose not to access all information available. These people pretend to speak for the community, but they do not. Many members of our community are enthusiastic project supporters. They are excited about the prospect of a renewed Columbus Centre with state-of-the-art, expanded facilities that are inclusive and meet the needs of all users in the broader community we serve. What worked in 1980 for the Columbus Centre struggles to sustain us today. The generous people and businesses who four decades ago contributed to creating today’s facility have moved on to support other activities. The large capital donations of the past have dried up. Our operating costs are funded exclusively by user fees for the cultural arts programs, fitness classes, dining and other services we provide. We are not redeveloping the Columbus Centre for any one generation or group of customers. Our goal is to redevelop the Columbus Centre both for Italian-Canadians and an increasingly diverse community, and for every generation, both now and well into the future. We are fully confident this is necessary to ensure the Columbus Centre will thrive and create a legacy for the future. It’s time for us to reimagine how we celebrate and share our culture. We need to re-engage with those Italian-Canadians who have moved away from us, to get them back to our facilities. We need to rethink how we attract 2nd and 3rd generation Italian-Canadians who may never have been supporters by offering them unique facilities and experiences that they can’t find in their local communities. We need to create compelling reasons for them to visit us, celebrate with us and share our wonderful Italian culture with everyone in the community. We are pleased to provide you with an update on the Columbus Centre/Villa Charities & Dante Alighieri Academy Redevelopment. We have been actively engaging with our communities on a number of fronts to gather input about the project, and have received valuable feedback. Your concerns and comments are important to us and will be addressed in the development of our plans. We will continue to share further updates as information becomes available and look forward to an ongoing dialogue with our communities. Thank you for your support. Villa Charities and the Toronto Catholic District School Board (TCDSB) chose to partner in the Columbus Centre/Villa Charities & Dante Alighieri Academy Redevelopment for one reason above all: to deliver more to the communities we each serve. The partnership makes it possible to significantly expand the total area available to both organizations by adding to their exclusive-use spaces with designated shared-use areas. All users will thereby gain access to a wider range of activities and programming in enhanced, state-of-the-art facilities. For example, the new facility will include a 435-seat multi-purpose performing arts theatre for use by both organizations. Notably, a theatre was part of the original plan for the existing Columbus Centre about 40 years ago, but it was not built due to the cost. Thanks to today’s partnership arrangement, we can now realize the original vision and significantly expand Villa Charities’ cultural programming with concerts, Italian film, and much more. The partnership also means other cultural programming opportunities can be delivered to local and national Italian-Canadian audiences. For example, Villa Charities will now be able to offer world-class Italian cooking classes in a shared, high-tech culinary studio. The studio’s digital learning technology will enable live interaction with chef instructors in Italy and beyond. Partnering also makes it possible to provide a 21st century learning environment with additional studios for dance, art and music programs; a broader range of fitness facilities including a triple gymnasium; classrooms; and community event facilities. The Villa Charities-TCDSB partnership delivers other benefits as well. For example, a single building envelope means that planning, design, construction, operating, maintenance and other costs are divided between two organizations. Sharing designated spaces means increased building utilization, thereby improving the overall return on investment. Partnering also makes it possible to employ advanced, energy-efficient technologies that would otherwise be out of reach for each organization on its own. The resulting cost savings are being reinvested by both partners into enhanced programs, facilities, amenities and services that will benefit all users. A joint-use agreement between Villa Charities and the TCDSB will ensure that the needs of current and future Columbus Centre users will always be fully respected. Joint-use spaces will be clearly defined and controlled, and access to those spaces will be made available to each organization via separate, secure entrances at different times of the day. I am pleased to provide this update on the Columbus Centre/Villa Charities & Dante Alighieri Academy Redevelopment. Please be advised that the Columbus Centre will remain open and fully operational until June 30, 2018. All staff, and the programs and services we offer, will continue to be located in our current facility until that time. As previously communicated, we are actively working on locating sites within our local community for our cultural and athletic programs, services and administrative offices, and we will do our best to maintain service continuity. Details on the new locations will be provided when they are confirmed. Demolition and construction are expected to begin in summer 2018, and the new facility is expected to open in fall 2020. I will continue to share further updates with you over the coming weeks, as the project planning advances. Thank you for your ongoing feedback and support. As the Columbus Centre/Villa Charities & Dante Alighieri Academy Redevelopment moves forward, it’s helpful to understand where we have come from. So, let’s take a moment to look back to the origins of Villa Charities and the Columbus Centre. Our organization dates back more than 45 years to April 1971, when we were established as the Italian-Canadian Benevolent Corporation (ICBC). The ICBC was originally created to provide culturally sensitive long-term residential care for elderly Italian-Canadians – an idea that took shape with the opening of Villa Colombo in January 1976. One year later, in 1977, the ICBC set out to purchase the 12-acre site including the existing buildings of the former St. Mary’s Training School, a correctional institute for girls, to develop a modern social, recreational, cultural and athletic complex – the Columbus Centre we know today. With Ontario Provincial Government assistance and a Wintario lottery grant, the ICBC purchased the southern 6 acres and, separately, the Province purchased the northern 6 acres, where the 1950s-era training school buildings were located. This parcel was leased back to the ICBC and, later, sold to our organization. In early 1978, the ICBC Board informed the community that $7 million was needed over five years to transform the training school buildings from their original purpose as a correctional facility and expand it to accommodate the Columbus Centre’s full range of activities. (The budget ultimately grew to $12 million, of which one-third was funded by a Wintario grant). In May 1978, a model for the new Columbus Centre was unveiled, and renovations and construction work got underway that fall. The Centre officially opened two years later, in October 1980. The Columbus Centre and its grounds have remained largely unchanged since that time. In subsequent years, in an effort to better serve the community, the ICBC developed housing for independent seniors, beginning with the opening of Caboto Terrace in 1983 and followed by Casa Del Zotto in 1991. In 2004, Casa Abruzzo joined the Villa Charities family of organizations and we extended our reach north of the city with the opening of another long-term care facility, the Villa Colombo Vaughan/Di Poce Centre. In July 1995, the ICBC was officially renamed Villa Charities Inc. While the name was changed, the purpose and spirit of our organization did not. To this day, our Mission and Vision remain true to our roots – to celebrate and promote the Italian Heritage, Culture, Language, Arts, Food and Family Values, and to be the voice of the Italian Canadian community. Our Lawrence-Dufferin campus today is firmly established as the cultural heart of the GTA’s Italian Canadian community, offering thousands of daily visitors of all ages Italian cultural programs including language, dance, visual arts, music and culinary arts, exhibits at the Joseph D. Carrier Art Gallery, and athletic programs. Villa Charities is looking both to the future and its past as we evolve to take the next step in our rich history with the Columbus Centre/Villa Charities & Dante Alighieri Academy Redevelopment. The new Columbus Centre will continue to honour, preserve and share Italian heritage, language and culture, as it always has, with a new shared-use facility that will include the addition of a performing arts theatre and expanded cultural programming. The new facility will continue as a community centre and cultural destination serving a diverse community and a rapidly changing neighbourhood, and enjoyed by both young and old. Villa Charities is pleased to present the first edition of our newsletter focusing exclusively on the Columbus Centre/Villa Charities & Dante Alighieri Academy Redevelopment. This newsletter will be issued regularly to keep our community updated on Redevelopment progress along with important issues and information as it arises. The addition of a new pool and indoor track to the Columbus Centre responds directly to feedback from the Villa Charities community. The pool will be virtually identical in size to the existing pool. The indoor track, at 130 metres, will be 25 metres longer than the existing track, and is in addition to the half-kilometre outdoor pedestrian/running circuit. The indoor track has been made possible through the sharing of designated spaces with Dante Alighieri Academy. The new Columbus Centre and Dante Alighieri Academy will include both exclusive- use and shared-use facilities. This approach will significantly expand the total area available to both organizations and will provide all users with a wider range of activities and programming. A joint-use sharing agreement will be developed, which clearly identifies when and how shared facilities will be used by each group. The new Centre will be set in urban park-like surroundings, with an increase of 51 trees. The landscaping plan includes the planting of 129 new large-caliper trees and the removal of 78 existing trees. The parking area will be reduced by 54 spaces, from 658 to 604. This will have no impact on the number of spaces available for Villa Colombo, Caboto Terrace and Casa Del Zotto. The new Columbus Centre will support Villa Charities’ mission to honour, preserve and share Italian heritage, language and culture. We are absolutely committed to this mission, and this will be clearly reflected in our future programming, which will be enhanced with a new 435-seat multi-purpose community theatre. The new Columbus Centre will continue to serve as a community centre and cultural destination, enjoyed by both young and old, as it does today. Villa Charities President and CEO Anthony DiCaita has initiated weekly, open invitation meetings with the Columbus Centre and Villa Charities community, which began June 7th. These sessions provide an opportunity for informal discussions in smaller groups. To participate in an upcoming session, please call 416-789-7011 or visit our website at villacharities.com. As the Columbus Centre/Villa Charities & Dante Alighieri Academy Redevelopment plan takes shape, I would like to update our community on a number of important issues. Feedback we have received indicates that some community members are unaware of key changes and critical information concerning our project. The addition of a new pool and indoor track to the Columbus Centre responds directly to feedback from the Villa Charities community. In letters, calls and meetings, you have confirmed the important role our services, programs and facilities play in your lives. You spoke, we listened. And we responded. The new pool will be virtually identical in size to the existing pool and will o er a variety of new programs and features for all ages. The indoor track, at 130 metres, will be 25 metres longer than the existing track, and is in addition to the half-kilometre outdoor pedestrian/running circuit. Concerns have also been expressed about the sharing of facilities by Dante students and the Columbus Centre community. The new Columbus Centre and Dante Alighieri Academy will include both exclusive-use and shared-use facilities. This approach will significantly expand the total area available to both organizations and will provide all users with a wider range of activities and programming. A joint-use sharing agreement will be developed which clearly identifies when and how shared facilities will be used by each group. In short, we lose nothing by sharing some spaces and, in fact, we now have the ability to o er much more. The new Columbus Centre will be set in urban park-like surroundings, with an increase of 51 trees. The landscaping plan includes the planting of 129 new large-caliper trees and the removal of 78 existing trees, most of which are in fair to moderate condition based on the assessment of an independent arborist. The parking area will be reduced by 54 spaces, from 658 to 604. This will have no impact on the number of spaces available for Villa Colombo, Caboto Terrace and Casa Del Zotto. Your feedback has also made it clear that the new Columbus Centre must support Villa Charities’ mission to honour, preserve and share Italian heritage, language and culture. We are absolutely committed to this mission, and this will be clearly reflected in our future programming, which will be enhanced with a new 435-seat multi-purpose community theatre. The new Columbus Centre will continue to serve as a community centre and cultural destination, enjoyed by both young and old, as it does today. Since assuming the role of President and CEO of Villa Charities in January, I have been impressed with the passion of our community for this organization. Please be assured that, like you, I want the new Centre to offer the best possible facilities and programming to serve the needs and wishes of our entire community. Thanks in good part to your feedback, I am confident this will be achieved. I look forward to maintaining an ongoing dialogue with you as the Redevelopment project advances. To that end, I am pleased to be hosting weekly, open invitation meetings with our Columbus Centre and Villa Charities community, which began June 7th. These sessions provide an opportunity for informal discussions in smaller groups. For information on how to participate in an upcoming session, please call 416-789-7011 or visit our website at villacharities.com. In addition, we will soon launch a weekly newsletter to ensure you receive the latest Redevelopment updates, and will continue to provide other opportunities for dialogue. Thank you for your ongoing feedback and support. Please click here to download a copy of the above letter. At the Community Consultation Meeting hosted by Councillor Josh Colle on May 11, 2017, Villa Charities President and CEO Anthony DiCaita announced important updates to the Columbus Centre/Villa Charities and Dante Alighieri Academy Redevelopment, including a swimming pool and the plan to provide an indoor walking and running track. To view the full presentation from the meeting, please click here. The proposed swimming pool in the new facility will be the same size as the current pool in the Athletic Centre, and will include resistance jets. The new pool will be available for lap swimming, aquafitness, lessons and leisure activities. A preliminary solution has also been developed for an indoor walking and running circuit through the use of shared facilities within Dante Alighieri Academy. The proposed indoor circuit will be 130 metres, an increase in size compared to the current indoor track circumference of 105 metres. The new shared-use facility will be a reimagined space for Columbus Centre and Dante Alighieri Academy. The new state-of-the-art, intergenerational community hub is considered the largest and only co-development project of its kind currently underway in North America, and will better meet the needs and expectations of future generations and the communities they serve. To see the announcement for the new facility updates, please click here. Existing pool size: 8.5 m x 18.